AVAILABLE NOW! 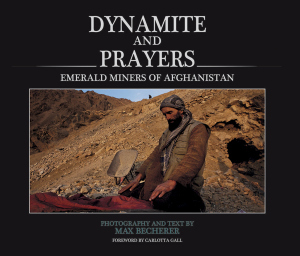 “Dynamite and Prayers: Emerald Miners of Afghanistan” a New Photo Book by Max Becherer. Today my book “Dynamite and Prayers:Emerald Miners of Afghanistan” officially goes ON SALE in the United States in advance of an exhibit of my photographs during the PhotoNOLA festival in New Orleans, Louisiana at the Second Story Gallery at 2372 St. Claude Avenue from December 10th to the 13th, 2015. Posted on December 7, 2015 by Lloyd Lofthouse. This entry was posted in Uncategorized. Bookmark the permalink. Who and why did destroy they countries and systems? We deal firstly with brutal political manipulations and nobody wants to address it? The suffering people are the results of such policies. Who and why did destroy their countries and systems? We deal firstly with brutal political manipulations and nobody wants to address it? Can the author attach also pictures of the key architects of such malicious social manipulations with their families living in the most prestigious residential areas, enjoying nice houses with happy children, nicely dresses wives, swimming pools and cheap maids? – it would represent awakening many people a very good ‘social contrast’. The photographed suffering people are the results of such policies.